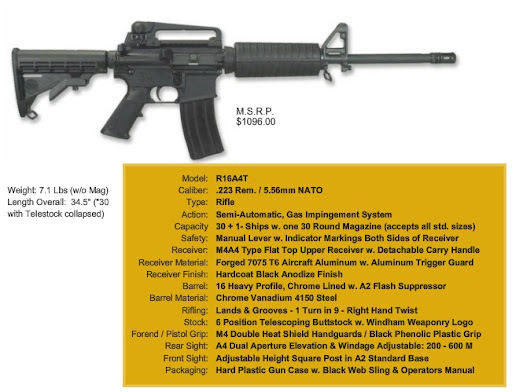 You know… Those guys who used to be Bushmaster… well now they are up and running and shipping ARs as Windham Weaponry. Based in Windham Maine. The newest issue of Guns & Ammo showed up at my house yesterday… on the cover was the new BerettaNano. Since I have yet to actually see one of these new guns in person, I was very excited to get the chance to read their run down on the new blaster. Its a great read, and if you are interested in the new Nano, you should pick up an issue and check it out for yourself. One thing that I thought was very cool was the fact that they pictured the gun on the cover actual size. I have long wondered why gun rags have not been doing this with handguns all along, and I think it is a great way to showcase pocket guns and this new crop of mini 9s. In the article they point out that the Nano is designed around an aluminum serialized frame that is removable from the “Tupperware” grip – ala the Kel-Tec or the Sig 250. They hinted at the idea that you would be able to switch out the grip frames for different sizes, but we will have to wait and see if that materializes…. I suspect that there might possibly be FDE or OD color variations in the future. A couple of other things I didnt know about the Nano are that the magazine release is reversible. Also, there is an internal magazine catch that will hold open the slide after the last round is fired… although you can not lock the slide open without the use of an empty magazine. Also, I think the magazine will be officially called a “single column rapid reload magazine with ultra-concealment flat basepad”. No kidding… thats what they called it in the article and it literally made me laugh out loud. The sights are adjustable and easily replaceable by means of a hex wrench. There is also no magazine disconnect for the pistol. The Nano will also be making an appearance in .40 S&W and 9x21mm IMI. The thing I found most interesting is that there is a striker deactivation button that is located near the back of the grip frame. It is used to deactivate the striker before disassembly and must be depressed with a punch or other similar devise. For the record, they said the gun was ‘very comfortable’ to shoot. From a woman who knows a thing or two about guns. Richard over at GHAG has a really interesting email posted up about the Delta Force’s (Yes, the real honest to goodness ninjas) approach to handguns. Apparently, those 1911s that they were so famous for were abandoned because they were so high maintenance… including the need for regular X-Rays. Wow! They also are believers in the philosophy of ‘put as many shots into the SOB as you can until he stops‘. As Richard says, they train to where the body armor is not. Shelley Rae over at Gun Nuts has a nice read up about her initial experience with the Ruger 1911… She was not thrilled, but does reiterate that there is one other 1911 out there that will send a thrill up your leg. Robert is documenting what seems to be a lemon of a Kimber Solo. The company states that its gonna be a finicky gun and has very specific recommendations about ammo selection. However, their test gun wont even run that. My big question here is why. Why is the Kimber Solo the only pocket 9 out there that requires such a temperament? Its obviously going to lend itself to many pieces of junk making their way into the hands of their customers, and it looks to me like Robert has such an example. *Just reaffirms my position on those pocket 9s. From what I have been reading, I personally think the Solo is a complete pass. A review… and some great pics too.